The OC Mama: Mom I'm bored! So have you heard I'm bored 57 times so far this summer? I've been trying to keep the kids busy, without spending a fortune. What can I say, I'm cheap. We've done a ton of outings with our local Playgroup. 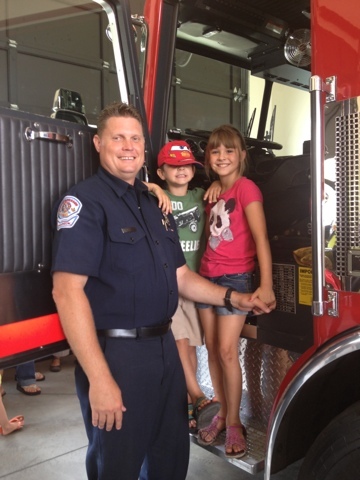 The kids had an awesome time touring the fire station last week. We've gone to the pool, played with friends, gone to parks and visited the beach. Unfortunately now that summer is really upon us (it was 106 over the weekend) we'll be looking go even more fun cheap ways to stay cool. Here's one we tried the other day. 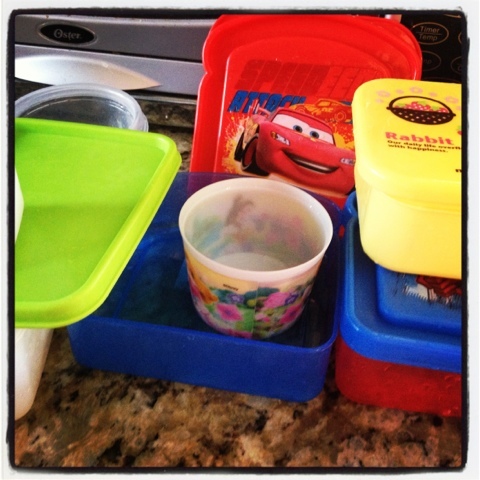 We got all the empty Tupperware containers we could find. The more shapes, the better it will be. 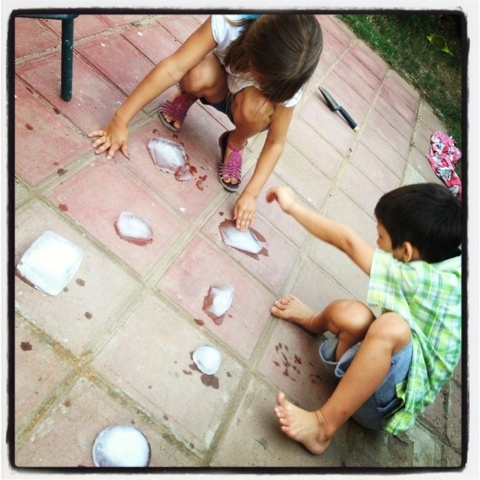 Then we filled them with water and next we put them in the freezer. And then we forgot about them. Okay really little A did not forget about them! He asked every 10 minutes if they were ready. 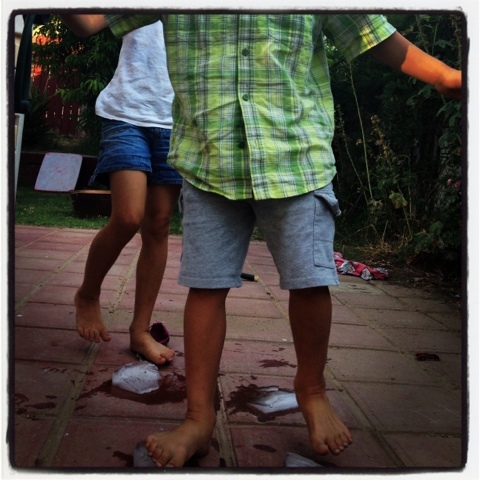 Eventually they were frozen so after dinner we dumped them out and they played with them. The plan was to build a castle. 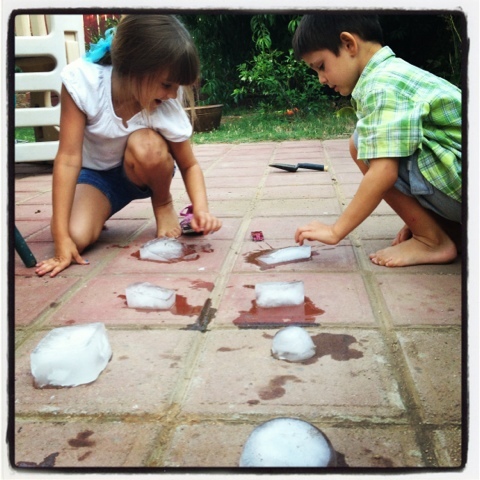 They spent about 2 minutes doing that, then they moved onto figuring out what the ice would do. 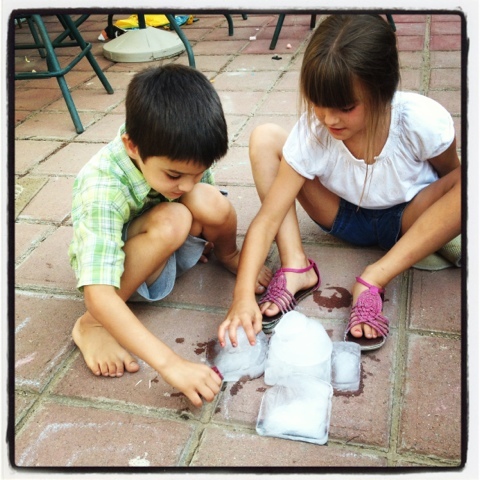 They put each piece of ice on its own brick on the patio so they could see which ones would melt fastest. They also had to walk on the ice and see how it felt on their feet. Next they covered the ice with blankets and sat on it. They definitely didn't do what I expected but they sure had fun. And it kept them entertained for at least an hour.